Two years ago, I never would have identified myself as a runner. Sure I was on the girls’ track team back in high school, but I wasn’t very good. During my college years, I would eke out a few miles on the treadmill at the Preston Center, all the while feeling like I was going to die at any moment. 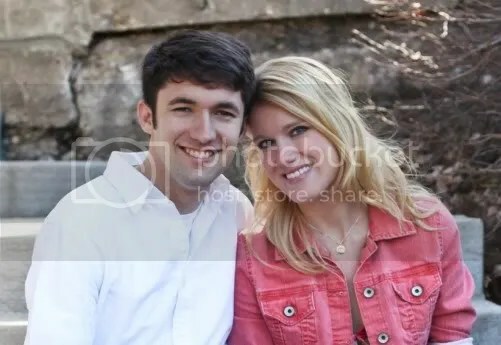 How ironic that the guy I met during my sophomore year, who would ultimately become my husband, ran cross country and track for WKU. 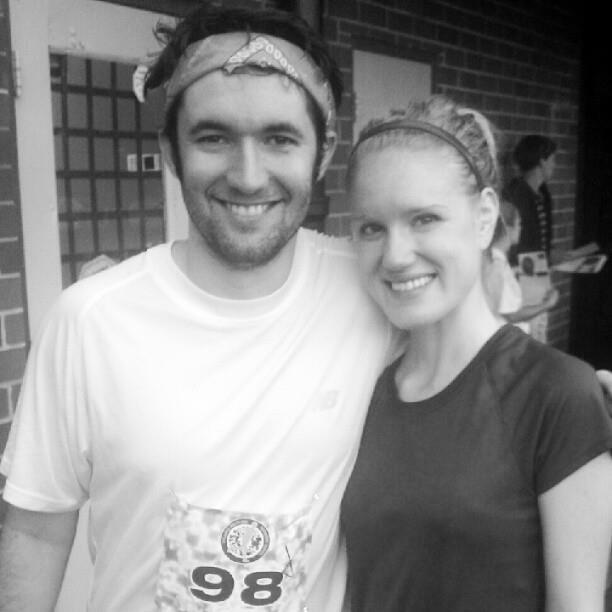 After getting married and moving to Atlanta, it wasn’t long before I tried taking up running again. 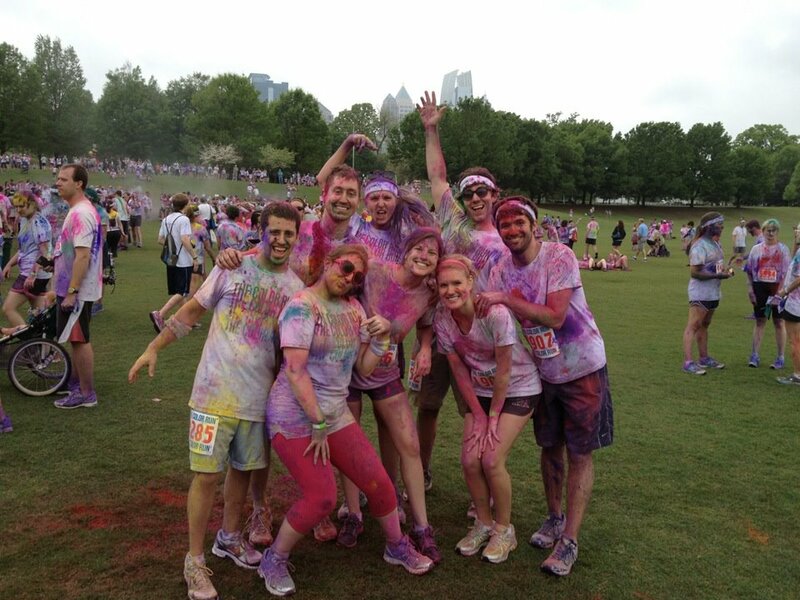 In the spring Drew and I, along with several other couples from our house church, participated in The Color Run. It was my first race since high school, and my first ever 5K. Even though I would really consider it a “race”—there was a lot of starting and stopping around the color stations and it wasn’t even timed—I had so much fun. The atmosphere was unlike anything I had experienced before–thousands of people, covered head to toe in every color of the rainbow, having the time of their lives. I immediately wanted to find another race to enter. The Color Run 2012. So much fun! At the finish line of the Atlanta Beltline 5K. Exhausted but happy. The Atlanta Beltline Southwest 5K was my next race. By then I had a regular running routine and had a goal time of less than 27 minutes. As Drew and I crossed the finish line together, the clock read 24:55. I blew my goal time out of the water! I ended up finishing 2nd among the women in my age group. I can’t remember another time I felt both physically exhausted yet emotionally electrified in my entire life. A few months later I registered for the Beltline’s Eastside 10K on December 1. It was a pretty big step for me and I felt a mixture of giddiness and nerves as I clicked the registration button. I would have to increase my training quite a bit but thankfully I had plenty of time to do it. By September, I was running six miles around our neighborhood easily. Almost too easily. I thought if I could run so many miles one day, why not do it the next? And the day after that? I barely heard Drew’s warnings that I should have shorter distance days and easy days where I just run a short jaunt through the park for the fun of it, not worrying about mileage or time. Oh, and the concept of stretching was completely foreign to me (bad Megan). I went from running 15 miles a week to logging 30, sometimes even more. Needless to say, it wasn’t long before my right knee started protesting the heavy increase in mileage. It was the same knee that I experienced problems with during high school. I vividly remember one track meet in particular where I had to tie pre-wrap around my patella and hobbled miserably through the 400. Just like that race, I thought I could push through the pain and continue to run. After all, I had a race to train for and with the registration being nonrefundable, I wasn’t about to give up my bib number. The first week in October, in the middle of my usual long run, my knee finally put its foot down (well…you know what I mean) and I had to walk/hobble that last mile and a half back to our apartment. Days later, my knee was still sore and I pretty much had to quit running cold turkey. As the weeks went by, my hopes that I would be healed in time for the 10K were quickly dwindling. I couldn’t even complete a mile on the treadmill without feeling that dull ache. A few days before the race I contacted one of the organizers and asked them to give away my bib number to someone else. I purposely slept in on the morning of the race so I wouldn’t have to think about where I should have been at that moment. It was entirely my fault for stubbornly overtraining, not listening to my body, and ignoring the advice of my husband (seriously, it was like I had a live-in running coach…you think I would have listened). It was late December, almost three months after the knee pain began, before I even entertained the idea of running outside again. My first few runs back were short and not exactly sweet; the second mile would come and that old familiar ache would start to spread through my knee and along my IT band. This time I didn’t push myself; I stretched, applied ice, and took things slow. Patience has never been my strong suit—it’s doubtful whether I possess much at all—so I firmly believe that this temporary setback, while extremely frustrating at times, has been for the best. 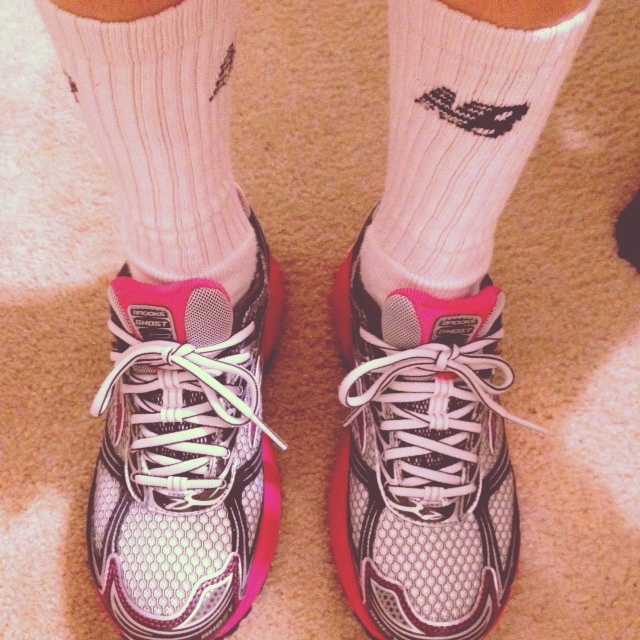 I’ve recently gotten several things that have helped make running fun for me again. Drew gave me a Garmin Forerunner watch for Christmas, which I never leave for a run without. I also bought myself a pair of Brooks Ghost running shoes after going to a specialty store and having my stride and form evaluated on a treadmill. 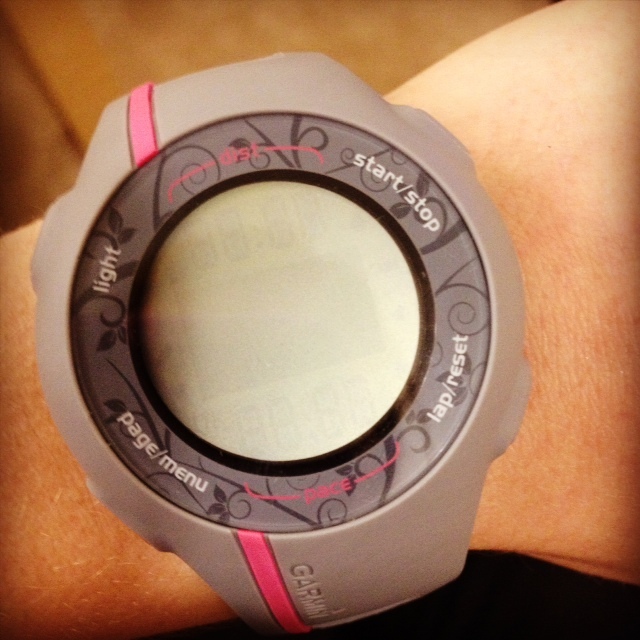 My Garmin Forerunner watch…so now I don’t have to guesstimate my time or how far I’ve run. It’s now February and beside this year’s upcoming Color Run—it wasn’t even a question whether or not we would run it—I have no real intentions of signing up for a “real” race anytime soon. I still love my morning runs; there’s nothing quite like waking up before the rest of Midtown, running in the dark through Piedmont Park, with the only other souls I encounter being fellow runners. Through our heavy breathing, and the occasional snot bubble in this cold winter weather, we wave or simply nod a silent but understood creed only runners seem to truly understand. Running is the only time I can completely turn off the thoughts that consume my mind the other 23 hours of the day. It’s cheaper than therapy, healthier than other vices and oddly spiritual. While I like having goals, training for that 10K took the fun and joy out of running. It’s taken me years to actually enjoy the act of running; I’m not about to spoil that with a reoccurring, and completely avoidable, injury. For now, I’m completely content with running for me. Brooks Ghost come in pink now?!?!? Uh oh. I have blue and green from last year. Pink may be in my future. My faves. Awesome post Megan. I know I have fallen into a similar bucket with running, though thankfully. I’ve stayed injury free for the most part. Taking things slower, although as incredibly frustrating as loving what you do and love the challenge of beating a goal pace is, learning limits is even more so. We are still human. And I’m certain even when moving a little slower and not quite as far, you are still going to CRUSH your next race. If you guys are here in July, sign up for the Peachtree! You’re so right. Learning my limits, and then learning to *accept* them, has definitely been a process. Hopefully it will help me become a more well-rounded runner as a result. I’d love to try the Peachtree race but we’ll be in KY for a wedding at that time. Are you doing the Color Run again this year? Just thought you should know that it was because of your original post about the color run that when it came to Des Moines this year I got super excited, got a team together, and signed up immediately! It was a blast. You never know who your blog and running journey will affect! Your comment just made my day! I’m glad to hear you enjoyed The Color Run as much as I did, it’s a great race.